Self-catering holiday Bed & Breakfast in Farmhouse - Appartamento "Giardino"
Property 48: Self-catering holiday Bed & Breakfast in Farmhouse - Appartamento "Giardino"
My husband and I stayed with Catina for a week earlier this month. Catina is a very personable and hospitable. We love her and hope to remain in contact. The cottage that we stayed in was very charming and spotless. The scenery on the drive up to the cottage was outstanding and we got to see some deer on the property. We would definitely stay with Catina again!! Incredible property with amazing views! Torre Casalta is right out of a storybook. This 13th century watchtower has been beautifully restored into a private sanctuary with breathtaking views from every window and terrace. It is more beautiful than any hotel or resort we have ever stayed. It is more beautiful than the photos! Gil and his team were fantastic hosts with great communication throughout. It was immaculate when we arrived. The location is perfect for visiting locations near Florence. The train station is 10 minutes away and a short hop into the heart of Firenze. When we left home we planned on sight-seeing as much as possible. Once we got to the Torre Casalta we found we wanted to just stay and enjoy the amazing views, bird songs, and the sunset. If you are lucky enough to stay here make sure you spend at LEAST one evening to do nothing but watch the sunset over the mountains. The value is amazing for the size of the rooms and the property. We literally spent hours just taking photos of the Torre and the views. 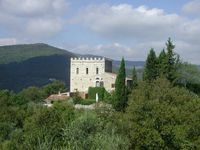 If the Torre Casalta is available during your trip to Tuscany I highly recommend that you jump on the opportunity. You will never regret staying here.